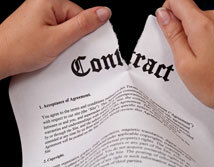 Sometimes it seems as if business agreements are made to be broken. No matter how carefully crafted, someone either finds a loophole or simply ignores the terms of the contract altogether. Your attorney needs to prove that breach of contract with evidence. Allied Business Solutions has the experience you need in such matters. Having worked for large and small victim companies over the past 30 years, we are familiar with laws regulating our actions and can converse with your attorney in a knowledgeable way. We also document unfair competition and present the evidence properly, so that if the law provides recourse, you have it.